A fireplace isn't just something that provides heat but it can be a major centerpiece for the rest of the room and as such making the right decision is key. You may be embarking on a brand new build, replacing an old or tired looking fireplace or undergoing a room transformation. Whatever the reason a fireplace can be a great addition and investment for your property. Our friends at Cast Fireplaces understand that there is a lot to consider when choosing a fireplace, so have compiled a list of considerations to help you choos­e the perfect fireplace for you. They are also giving you the chance to WIN a stove worth £400! Working out how much space you have available can be an indicator of the size and type of fireplace that may suit your home best. It is important to install a fire that can adequately give the heat output required for the space available. Underestimating this could mean not warming your room sufficiently which could leave your home inefficiently heated and costing more in the long run. Heat output calculators are useful for making an informed decision on which size to buy, all you need is the width, length and height of your room which when calculated gives a nominal kW heat output for your fireplace. What is your favourite fireplace design? The style and designs that you are drawn to are likely to heavily influence your decision about which fireplace to choose. Practically speaking there are styles and finishes available that can be adapted for traditional and contemporary properties and to match existing decor. Limestone fireplaces can be more suited to a more modern look whereas wood may give a more traditional feel. Whatever your favourite design is rest assured that there are a wealth of options available and as fireplace experts we can help you achieve a tailored design for your home. 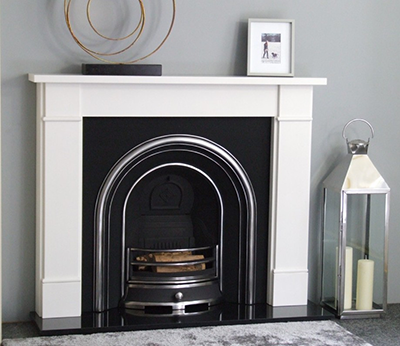 Whilst many fireplace suppliers have a range of options depending on a particular budget it is worth having a price in mind as they can vary depending on style and materials used. For those fireplaces that require a chimney it is worth considering any structural changes that may need to be made to your home if you don’t have a chimney already. This could drive up the price of installing this type of fireplace and would need to be included in any renovation or restructure costs. What kind of heat supply do you want? Depending on the type of property you live in then the fuel type for your new fireplace could be predetermined. However, it may be possible to change this to suit your needs and our friends at Cast fireplace will help you decide a course of action based on your home. They provide fireplaces to suit all fuel types from gas, electric, solid fuel, multi fuel and pellets which is why they can be confident they have something for everyone. Cast Fireplaces are giving one lucky reader the chance to warm up this winter and win a Forgemaster Fuel Stove worth £400.